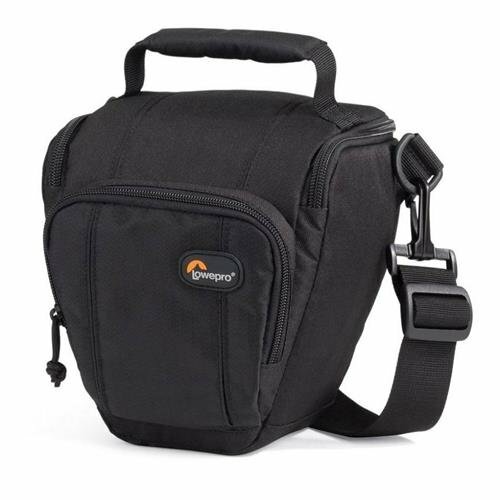 This toploading bag offers a weather-protective, streamlined and easy-access solution for outdoor enthusiasts who are passionate about their photographic pursuits. Features a patented, built-in All Weather AW Cover protects gear from the elements. Easy-access lid with dual zipper pulls opens away from body and provides full access to gear. SlipLock attachment loop expands carrying capacity. Fully padded interior protects gear; horizontal divider allows storage of extra lens in main compartment. Interior zippered pocket with memory card storage provides space for spare memory card and other accessories. Removable/adjustable shoulder strap offers a custom, comfortable fit. Belt loop and padded grab handle offer extra carrying options. The Toploader Zoom 45 AW fits a DSLR with attached lens (up to 18-55mm f/3.5), memory card and accessories. Internal Dimensions: 16 x 10.5 x 16.3 cm (6.30 x 4.13 x 6.42 in); External Dimensions: 18.5 x 16 x 22.5 cm (7.28 x 6.30 x 8.86 in); Weight: 0.2 kg (0.44 lbs).